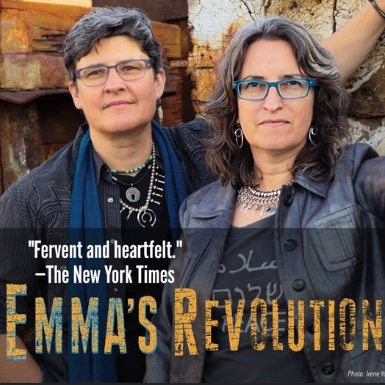 Get invested in song and join us for a workshop with Emma's Revolution before the performance on the 2nd! This workshop is not included in our Season Ticket packages. Seating is limited, so get your seats early for this special opportunity. What are the songs that inspire you to take action? That awakened you in a way you hadn’t considered? Share, discuss and sing together as we discover strategies for using music to fuel progressive movements. Learn to strengthen your voice as a tool for change and tap into the power of community, from award-winning activist musicians who have performed at thousands of justice events, concerts and demonstrations, writing songs sung around the world. Tickets for the workshop can only be purchased through this website. Tickets are available online until noon on Friday, February 1st, after which tickets are available at the door. This workshop is not included in any Season Ticket package and seating is limited!